Vicky Chow Bio: Canadian pianist Vicky Chow has been described as “brilliant” (New York Times), “a monster pianist” (Time Out New York) and “new star of new music” (Los Angeles Times). She is the pianist for the Bang on a Can All- Stars and is now also a part of Grand Band, New Music Detroit, and has collaborated with other ensembles such as the International Contemporary Ensemble, Wet Ink Ensemble, and the Wordless Music Orchestra. She has performed internationally in Asia, Australia, Europe and North America. As an artist frequently broadcasted on WNYC’s Q2 radio, her recorded work can be found on the ‘Nonesuch’, ‘New Amsterdam’, ‘Tzadik’, ‘Cantaloupe’,’ Innova’, ‘Hinterzimmer’, and ‘AltaVoz’ labels. Interviews and articles featuring Ms. Chow was published in the Huffington Post, Gramophone, The New York Times, The Vancouver Sun, and many more. 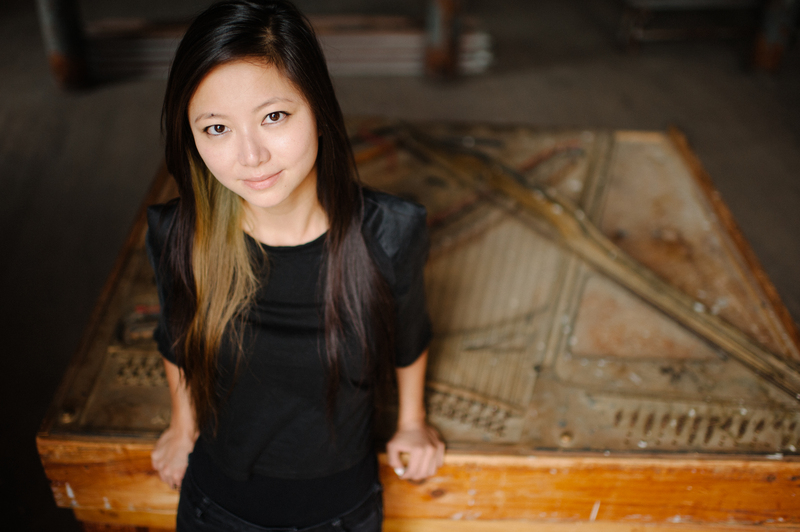 In addition to performing, Ms. Chow produces and curates “Contagious Sounds”, a new music series focusing on adventurous contemporary artists and composers in New York City.Her recent recordings of Steve Reich’s Piano Counterpoint (Nonesuch) and Tristan Perich’s Surface Image (New Amsterdam Records) was included in the top albums of the year lists such as The Rolling Stone Magazine and Rhapsody. Her performances of Morton Feldman and John Cage were featured on BBC3‘s documentary series ‘The Sound and The Fury’, based on Alex Ross’ book ‘The Rest is Noise’. Her next projects include a piano concerto by American composer Ronald Bruce Smith in collaboration with BMOP, solo piano works by Pulitzer nominated composer Chris Cerrone, Alex Mincek, David Franszon, and Canadian composers Adam Basanta, Fjola Evans, and a new piano/percussion duo work by Vincent Ho.